The Eppendorf Mastercycler Pro Thermal Cycler brings you a flexible powerhouse with consistent heating and cooling. This PCR system can operate in three modes, stand alone, min-satellite, or as a daisy chained PC controlled network. This PCR machine features Steadyslope and vapo.protect technology, to keep temperature rates consistent, and reduce evaporation and allowing users to work with low reaction volumes. Heating and cooling in this thermal cycler happens rapidly thanks to a hot start function that increases rates up to 8° per second. The Eppendorf Mastercycler Pro Thermal Cycler allows you to be modular with your block formats, with an intuitive graphic display to guide users through programming. In fact, programing the gradient functions of this PCR through the control panel is designed to get even the most inexperienced user up and running safely. Gradient temperatures in this thermal cycler can be programmed freely across 12 rows, with a range of up to 20°C. The gradient slope of these PCR systems make sure identical heating and cooling ramp rates are present in both normal and gradient functions, while the heated lid uses integrated thermal sample protection to keep samples safe. 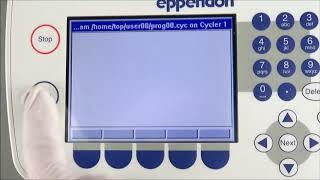 This Eppendorf Mastercycler Pro Thermal Cycler has been thoroughly inspected and is performing beautifully. All of our lab equipment comes backed with our standard warranty. Should you have any questions, please don't hesitate to contact us.